You're doing too much and it's a disservice to you and your startup. Here is why you should aim to accomplish only ONE thing each day. I consider myself a highly productive guy, despite many, many challenges to the contrary. I’ve got crazy ADHD. I run a company with over 150 people who need my attention all day long. I am responsible for being the CEO of the company, writing copy, managing our financials, new product strategy, acquisitions, and about 90 other things. I also have 2 little kids and my family lives in 2 cities that we travel back and forth from constantly. It’s nuts. My life is defined by distraction. 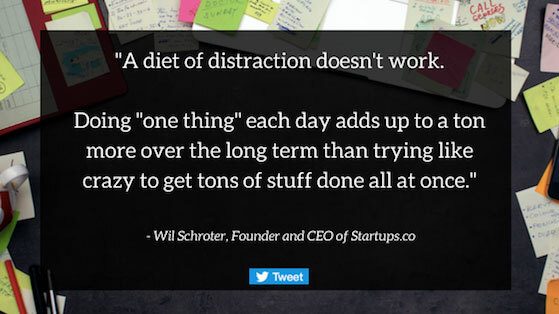 Yet the reason I can constantly stay on top of so many things isn’t because I’m always getting lots of stuff done simultaneously – it’s because I focus on getting just one thing done every day. One thing. Every day. That’s it. You and I are probably looking at the same daily checklist of stuff we’re going to knock out today. It ranges from getting that one blog post written to launching that Facebook campaign to finally picking up your dry cleaning. We create these lists because we want to feel like we’re productive. The reason we don’t get as much done as we want is because it’s so damn easy to lose focus. Our entire day conspires against our focus. Our focus is in a constant battle between emails, Slack chats, social media updates, the endless notification updates on our phones. We’re in a video game where we have to battle nonstop to keep basic focus. The worst part? It’s mostly self-imposed. We can pretend that we can cut out all of those distractions, but sadly, we won’t. It’s like saying we could cut out all carbs and we’ll look like a Bowflex or Peloton commercial. Except we won’t. Tacos are too delicious. So instead of pretending we’re going to go on a “Distraction Diet”, let’s focus on what we can control — focusing output. The only way to ensure progress is to get insane about your focus. I used to make long checklists of things I was going to get done. It felt good. It felt like I had cleared the hard drive of my mind and this list would manifest into startup glory. And that’s where I totally messed up. You see, we can’t get 3 things done today. We can get one thing done. If that actually gets done.. maybe we can do a second. On a great day — like the day we’re hoping to have but never do — three things will get done. But, the truth is, accomplishing one thing each day consistently is how everything gets done. Years ago I moved to the “One Thing Rule.” I still make long checklists of stuff because it helps me get all of those ideas out of my head. But I don’t think of those checklists in terms of all the things I’m getting done today. 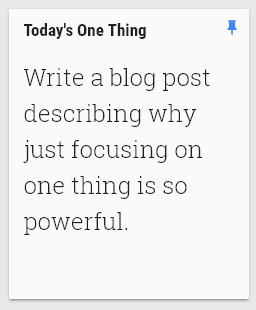 I use a neat little product called Google Keep which allows you to create checklists and little post it notes that sort of follow you everywhere. It’s all the product does and it does it really well. That said, you can use literally anything else. My rule is that today I pick the ONE thing I’m going to get done, no matter how small it is. If it’s a task that is going to take me the entire week to do, that’s fine. I just leave that as the only thing and don’t change it until it gets done. Now don’t get me wrong, I do other stuff during the day, some of it is even on my checklist. But I always leave my “one thing” visible so that I don’t let my distractions take me away from that one thing. The goal is to keep coming back to it. What I’ve found, and I’m guessing you’ll find too, is that those “one things” add up to a ton more over the long term than trying like crazy to get tons of stuff done all at once. Let me go back to the diet analogy. If you set out to lose 10 pounds you’ll likely never do it. The belly hanging over my jeans can attest to this. But if you get insane about losing 1 pound you’re almost certain to do it. If you put that energy into one pound every week, you’ll far more likely to lose 10 pounds. That’s the way I think about progress in our startup. We get laser focused on just one thing, but unlike lots of other companies, we actually get that one thing done – because we have nothing else to focus on. When I look back on all the startups I’ve built, and all the thousands of Founders that I’ve met with, what has defined us all isn’t the stuff we put on checklists or things we set out to do. It’s the sum total of what we actually got done. So, I just focus on that one thing at a time and I actually get it done. I’m hoping you will too. Wanna know what separates founders from successful founders? Startups.co founder Wil Schroter shares some of the 7 common habits he’s observed in entrepreneurs that have helped them succeed along the way. Looking for an expert to help evaluate your idea? Got an idea that you’re ready to take from evaluation to execution? Check out Noor Siddiqqis’s advice on early Idea Execution. Wil Schroter is the Founder + CEO @ Startups.com, a startup platform that includes Bizplan, Clarity, Fundable, Launchrock, and Zirtual. He started his first company at age 19 which grew to over $700 million in billings within 5 years (despite his involvement). After that he launched 8 more companies, the last 3 venture backed, to refine his learning of what not to do. He's a seasoned expert at starting companies and a total amateur at everything else.